AmeriTitle’s Unique Fundraisers Are A Key Differentiator | AmeriTitle’s Unique Fundraisers Are A Key Differentiator – AmeriTitle Inc.
AmeriTitle’s 2017 Big LeBocce Charity Bocce Ball event turned out to be a lively and successful gathering. Before sharing the results of the tournament, we would like to share some of our unique fundraiser history. AmeriTitle provides escrow closing services and title insurance products. Due to the regulated nature of our industry, there is not much differentiation between competing title companies when it comes to the services and products offered and rates being charged. We strive every day to set ourselves apart with excellent customer service and accommodating attitudes, but I think our secret sauce is made up of our community involvement and non-profit support. We have always been involved in the community, but we caught lightning in a bottle with the first AmeriTitle Idol in 2007 and it was proof of concept that we could generate significant financial support for worthwhile causes while simultaneously promoting our business. AmeriTitle Idol was a live-band karaoke competition that traditionally ran one night a week for four weeks in May. The first three weeks were preliminary rounds complete with judges and text voting for the audience. Finalists were brought back for the fourth week where the AmeriTitle Idol was crowned at the end of the night. Spectators paid a $10 cover at the door each night which went directly to that evening’s featured non-profit. We ran it this way from 2007 to 2012 raising just over $53,000. Then in 2013, we got a permit to shut down Church Street in front of our office on a warm August evening for an all-star event where we brought out the best of the best from prior years. Attendance was in excess of 500 people and we raised just shy of $28,000 through a $20 cover charge and various corporate sponsorships. That was going to be the grand finale, but due to popular demand, we brought back the traditional format one more time in 2016. All told, AmeriTitle Idol raised $89,905. At the time we decided to sunset AmeriTitle Idol in 2012, we organized the inaugural “Big LeBocce” and held it at Salem Golf Club. After much promotion, we put together a field of 40 teams who each put up $100 and designated a local non-profit. The format has been the same each year since and we’ve fluctuated between 48 and 64 teams each year. Every team gets a pass in the first round (win or lose) and then it’s single-elimination from there, with the winner taking all for their designated organization. AmeriTitle also funds a costume contest in order to promote creativity and add some fun flair to the day. The rounds are 15 minutes each on eight courts with a new set of matches beginning every 20 minutes. The timing is well-regimented in order to get it all finished in roughly a 5-hour time period. The atmosphere is really fun with music playing and lots of food and beverages available. 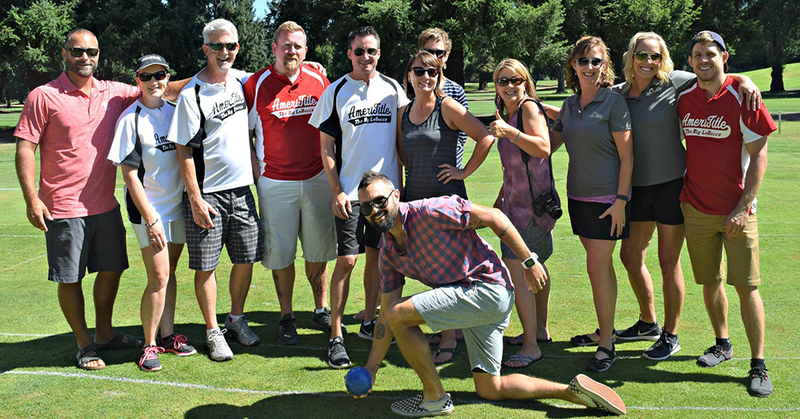 We have raised just over $40,000 from the Big LeBocce (including three tournaments in Silverton at The Oregon Garden). People will give generously to be part of a fun, well-organized event. I can’t think of a better way to promote AmeriTitle than by creating something that showcases our amazing staff, entertains our real-estate community, and raises much needed funds for our local non-profits. 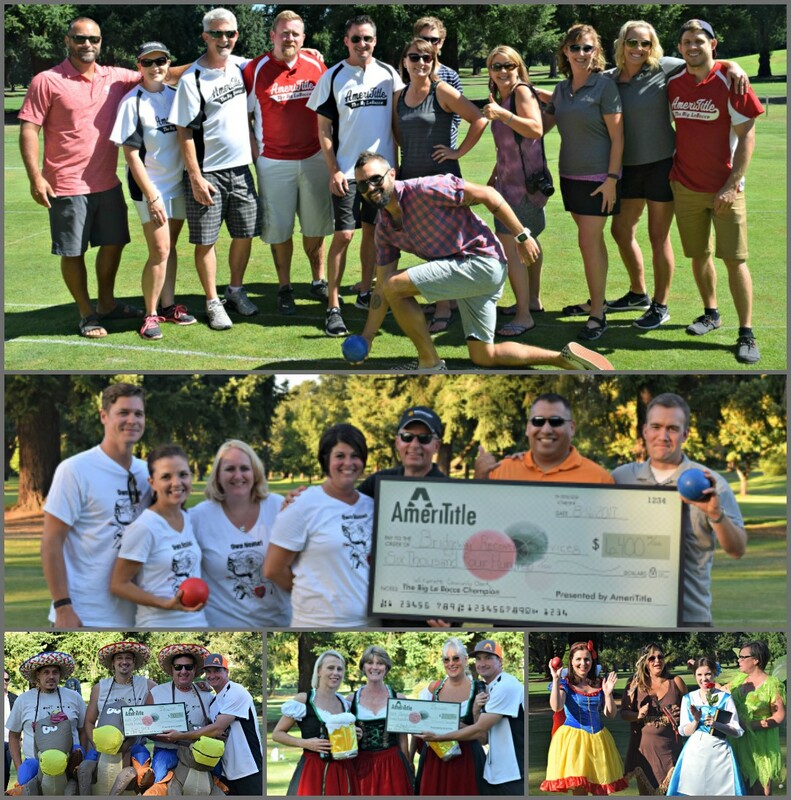 AmeriTitle would like to extend our deepest gratitude to the 256 clients, friends, family and community members who participated in The Big LeBocce – Charity Bocce Ball Tournament recently held in Salem. Thanks to their generosity of time and funds, we are able to give $7,000 to non-profits in need. Two lending groups, Guild Mortgage and Willamette Community Bank, went head to head to battle it out for the title of Tournament Champion. After a hard fought set, Willamette Community Bank rolling as ‘Bring the Heat’ came away as the victor. Their designated non-profit, Bridgeway Recovery Services received $6,400. The core of AmeriTitle’s unique events is to help make our community a better place to live and work. The philosophy behind the services that Bridgeway Recovery offers truly aligns with our goals. AmeriTitle extends our thanks to Salem Golf Club who kindly shared their beautiful space with us so that we could maximize the giving. They did an outstanding job accommodating our large group. Special thanks to the many AmeriTitle teammates who travelled from Corvallis, Albany, Lebanon, Salem and Silverton to lend their talents and make sure the event was successful. Pick me, pick me…….as I am relocating to Salem/Stayton Oregon area to be with my family and grand babies permanently. I have decided the best for me is to get back into title and escrow. I am researching the new laws, forms, (which I VERY MUCH like, and agree with since being a loan officer) and histories of the title companies. I have always been about community, and Amerititle is right up and down my alley. Fun, exciting, and serious about excellence in the most loving and humble way. So wish me well as I continue my journey, and I hope and pray I can present myself well enough to be part of this wonderful team.